Note: This article discusses the subject of death and dying, which may be sensitive to some readers. One day you get that dreaded phone call. You pick up the line and all you hear is a muffled cry, and it hits you. Your mom died. The emotions are so overwhelming: sorrow, loss, and the feeling of being unprepared. What will I do with her body? What are my options? What would she have wanted for herself after she passed? Being prepared in the present will help you have one less thing hindering your mind and heart when the passing of a loved one comes around. It is because of that uncertainty and fear of “what to do next?” that I am a Death Positive Advocate. Although, when I say that I am a Death Positive Advocate most people insinuate I am pro people dying, which is not the case. Immortality has yet to be established, so death is inevitable. What death positivity means to me is having my own end of life arrangements known and having the required forms needed available. Being Death Positive means being eco-conscious in the method I choose to dispose of my body after death. It means not being afraid to speak out about death and dying with others and asking the hard questions. For example, “Hey mom, what do want me to do with your corpse when you die?”, and not thinking for a second that it is morbid. It is believing in honoring a person’s end of life wishes, regardless of sexual, gender, racial or religious identity. Being Death Positive, is loving the memory of someone’s life. Currently, most people in America believe they only have two options for end of life arrangements: traditional burial or traditional cremation. Neither of these options are eco-friendly, nor are they the only options available to the public. With traditional burial, the body is embalmed with chemicals, then placed in a steel or sometimes wooden casket into the ground. Not only is this method costly, the toxic chemicals from the embalming process have the possibility of leeching out into the soil of the burial site. Then there’s option number two, cremation. It is the less costly of the two, but each cremation releases detrimental amounts of persistent organic pollutants or PoPs, namely mercury and dioxin into the ecosystem. Thankfully, there are two more methods that can be found in Pinellas County or the surrounding areas. The two additional options are not so different from traditional burial or cremation, but they are eco-friendly and may be less expensive, depending on choice. 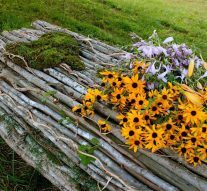 The first alternative available is natural burial. In Florida, there are seven cemeteries and funeral homes that are certified by the Green Burial Council that provide the option of natural burial. The Prairie Creek Conservation Cemetery, located in Gainesville, is a prime example, and it provides conservation burial. Prairie Creek does not have headstones or plaque over its sprawling 93 acres, but families can choose to plant wildflower seeds during burial or a native tree as a beautiful gave marker. A guide to a specific grave site is also available if needed. Prairie Creek even works with families who decide to have a home funeral, which means they have forgone the option of using a funeral director for their loved one’s care. The family takes care of the deceased, from body care to transporting the loved one directly to the cemetery. Alternative number two is called alkaline hydrolysis, which is essentially fireless cremation or “aquamation”. The resomation machine needed for the process is a pressurized container that uses 95% water 5% alkali. This mixture is then heated to 350 ° degrees and reduces the human body to bone ash, thus eliminating pollution from the equation. Anderson McQueen Funeral Home in Saint Petersburg, Florida, is the first facility in the state to offer fireless cremation. Touching back on the subject of a home funeral, you might be wondering what exactly that entails. Home funerals have been practiced all around the world for hundreds of years. Before the “Traditional American Funeral”, we took care of our own in life and in death. My own family, who live in Mexico, still practice this tradition to aid them in their grieving and to spend some last precious moments with their loved ones. When someone passes in the community, the immediate family gets together to cleanse the deceased and clothe them. Then, they present the deceased in the heart of the home where everyone gathers (The living room). Family and friends gather to say their last goodbyes and share a meal over the course of a couple days. Then they perform a natural burial in the mountains. It’s truly a beautiful thing to behold.